With the early days of fall bringing gusts of wind to your face and glowing Harvest Moons to the sky, it might seem like a great idea to don a flannel shirt and head to a dirt road covered in leaves. But any travel bookings you make in early October should probably pertain to your holiday plans, because as it turns out, right now is the cheapest time to book airfare for the winter holidays. According to research conducted by the travel app Hopper, which parses through historical flight data to help customers find cheap flights, the best time to book a domestic trip for Christmas is 83 days before departure, during the first week of October. So if you're looking to avoid a financial gouging at the hands of an airline, book your flight now, as airline seats often crest 75% of their original, non-holiday value in the month of December. In fact, time really is of the most frugal essence here, as Hopper maintains ticket prices increase daily as the holidays near. It's almost like the excess demand causes the prices to skyrocket, or something: "In the final two weeks leading up to Christmas, flight prices will spike by $7 per day," according to the company's annual Holiday Travel Index. But if you're a procrastinator who leaves holiday planning to the small, nail-biting minutes, there are still some viable options for saving a bit of scratch in the month of December. Hopper concludes that booking a flight on Saturday, December 16 or Tuesday, December 19 is likely to save you bundles. Comparatively, you'll be shelling out an additional $110 if you chose to book a flight on December 22, the busiest day of the year for Christmas travel. 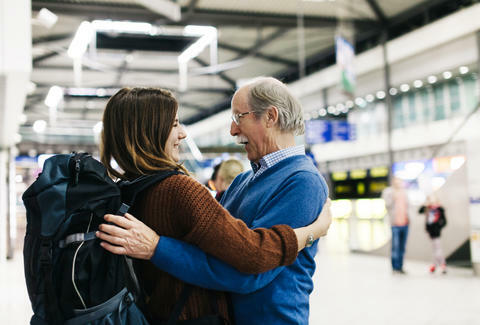 The situation is more or less the same concerning Thanksgiving, too, as prices typically jump $1 per day if you wait until early November to book your flight. The final two weeks of the month see prices balloon by an additional $10 a day, which likely will not bode well for your credit score or feelings of holiday cheer. In any case, it's never too early to start planning a trip back home to spar with your in-laws about fake news or why you're not married. Or, you could just book a flight to another continent and still have money to burn. Preemptive happy holidays, everyone.